Gardening is a great way to connect with your grandchildren while introducing them to valuable concepts like cause and effect, the source of the food we eat, and how to take care of living things. Kids will love tracking the progress of the plants the have started from a tiny seed. Let them decorate their notebooks with garden themed stickers and drawings. Encourage them to write down the date the seeds were planted, then measure and take notes on each stage. The can draw pictures alongside their notes, and even include seed packages or pressed plants. There are SO MANY options for fairy gardens these days that every year you and the grandkids can add new elements. There are mini indoor versions like the one pictured below that you can keep inside all year long, or you can create a space outdoors to attract fairies from all over! This one can be done indoors! Sow some grass seeds on a moist sponge placed on a plate, and put in a sunny window. Add fertilizer to your water each day, and watch grass grow before your eyes! There are many kitchen scraps that can be planted right back into the ground! 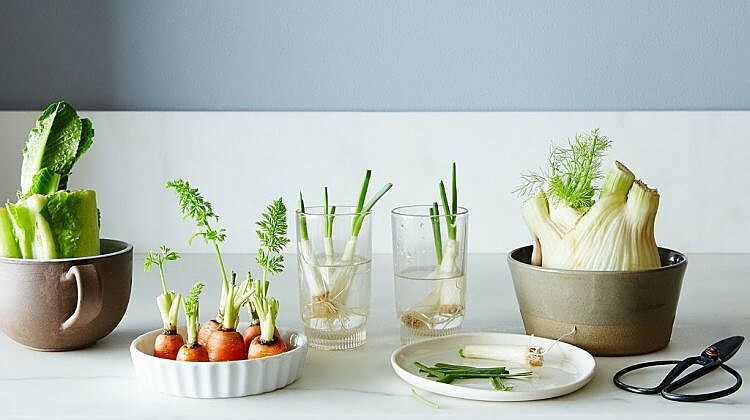 Put the bottom end of celery, cabbage, romaine lettuce, or green onions in a shallow dish of water until their roots sprout again, then plant them back into the dirt! Did you know that bean plants make great forts? Make a pyramid structure with long stakes or tree branches and tie at the top. Plant your bean seeds around the outside, and watch them climb! When you are cooking with eggs, try to only take off the top half, you can use the shells for planting! Clean out the shell, and gently draw funny faces on them. Add Wiggly Eyes too! Kids will have a fun time practicing drawing gently, make sure you have plenty of extra egg shells, as some will definitely break. Fill shells with dirt, then plant some grass, pea shoots, or radish seeds inside. Once the grass grows, children will have fun cutting the egg "hair". Do you have any other fun ideas to introduce youngsters to the joy of gardening? Let us know in the comments!